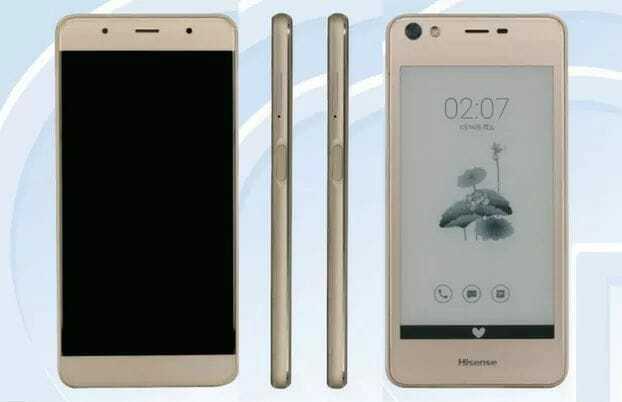 The Chinese gadget maker Hisense is about to become the latest company to unsuccessfully launch a dual-screen smartphone. Phone Radar and Liliputing report that the Hisense A2 has cleared China's regulatory agency, TENAA. The phone features a 5.2" E-ink screen and a 5.5" AMOLED screen. According to the paperwork, the Hisense A2 runs Android 6.0 on a 1.4 GHz octa-core Snapdragon 430 CPU with 4GB RAM and 32GB of internal storage. It has a pair of cameras (16MP with flash and 5MP), fingerprint sensor, microSD card slot, a 3Ah battery, and dual-SIM card slots. In terms of connectivity it has 4G, Wifi, Bluetooth, and GPS. And then there are the screens. The TENAA paperwork says the smartphone has a 5.5", 1920 x 1080 resolution AMOLED screen on one side and a 5.2", 960 x 540 resolution E-ink screen on the other. All in all, from what we can see with the specs this won't be a bad phone, but it's worth remembering that we still don't know anything about software support for the E-ink, at detail which has been the Achilles heel of this type of phone. About a half dozen dual-screen smartphones have been announced over the past few years, and so far none of the phone makers have put forward a good use for the secondary E-ink screen. In fact, from what users tell me most of the phones don't support their secondary E-ink screens very well at all. And while there's a good chance that Apple could buck that trend should the rumor of their dual-screen iPhone prove true, I don't see Hisense pulling it off. I have recently acquired YotaPhone 2 from Gearbest (thanks to a tip from your blog, THANK YOU!) and I am happy. Especially at the current price. I think that the e-ink is put to a VERY good use there. It has dedicated widgets on a series of user-configurable screens. This includes widgets with always-on Calendar, analog clock and, of course, an e-book reading app – my favorite widget. Always there, a double-tap away. You can also mirror the main screen with any conventional app on the e-ink. *Very* well designed software IMHO. But what about the other phones? I’ve heard a lot of complaints. The Yotaphone 2 has what’s called “Yota Mirror” that allows you to send everything to the secondary screen while keeping the primary screen off. This is what I’d like to see here too. Another thing – from the photo of the secondary screen here (that even be just a render), it may look like it has a frontlight. This can also be cool! It is awful. Atrocious. More often than not, I can’t even switch the daman thing on on the first try. Yet, up until I got my new YotaPhone it was my favorite on-the-go reading device. Once you do manage to switch it on and get it to display an e-book, all that matters is that single e-book reading app. And those are very nice to use. Especially AlReader. Please also note that InkPhone has Android 2.3.5 Gingerbread and isn’t a high-end phone. Just compare the prices of YotaPhone and Inkphone when they came out. I personally use the built-in YotaReader at the moment, just to get used to it, so I can compare it meaningfully with other and more configurable apps, such as CoolReader, Moon+ reader, AlReader … . YotaReader has much better font rendering than shown in the link above. So, it *IS* possible to get Yotaphone to render the text in a much less atrocious way. Unfortunately you have to update to Android 5.0 first. The e-ink display does render text in e-book reading apps just like the pictures in the linked comments show, *when you run it “out of the box”*. There is configuration file /storage/emulated/0/TitaniumManager/mirroring.cfg where you can set whether the particular application should use the quick black and white A2 graphics or slow, but much better 16 shades of grey graphics. And you can define other interesting things there, such as dithering (for the e-book reading apps you will want to set NONE). There is even an app for that at xda-developers forum. The author seems to be almost wholly unaware of the most well-known and successful dual screen phone on the market. Well, if it was such a smashing success, why is it being sold for a fire-sale price $120 at many Chinese on-line stores? I personally am extremely happy with mine, but apparently they weren’t selling that well when the Yota company was asking 700Euro for their most famous dual-screen phone. You got a link for that price? Do you mean the low price for the Yotaphone?